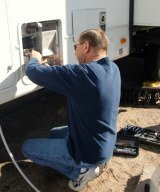 Does anyone live in their RV full time in Arizona (Phoenix) area? How cool are you able to get your RV? This is no problem. 36 ft 5th wheel. Two air conditioners, one in bedroom, one in living. 6,000 Btu in bedroom and 10,000 in living room. Both under 15 amps draw with remote temp control. Insulated windows on afternoon sun side with foil bubble insulation. Seldom used overhead air and maintained 78 degrees all year round. Did it for 5 years full time in south Scottsdale. Additional suggestions: Use Stainless steel braided washing machine hoses for outside water feed (will not blow up from heat) and run sewer line inside rain gutter with a cover to protect from heat. Be prepared to dump waste tanks and rinse every 3 to 4 day in the hottest months. Put a extra fan and cooling shield on outside refrigerator vent. The refrigerators die quickly with out extra cooling. This will get you through the summer and be easy on the pocket book. My husband and I have lived in Az for 10+ years, always in an RV. You will need to purchase a window ac,(at least 8,000 BTU). As a result we are able to maintain a temp of around 80-85 during July-August. We have a 30 ft tag along. Hope this helps. We live full time in our 5th wheel in Florida and had to put a second air conditioner in the bedroom. One unit could not keep up with the heat. I spent two summers there, in a large 5th wheel with thermostat controlled A/C. Since I own a dog, I installed a floor model in the bedroom to insure one would always be on for the dog's safety. And I would say, my rig only stayed cool because I did have a second one running in the bedroom. Once the heat began, the A/C did not shut itself off for 5 months, then suddenly one night, off it went, silence. After 5 months, it was cool enough. I still ran the bedroom one quite often, and anytime I leave the dog home by himself, it always stays on. I would say, if your serious, install two, a floor model is 100 times quieter, and yes, with both, stayed cool just fine.